Caspar Whitney : Hawai'ian Games, 1889. Something of Its History, Resources, and Prospects. Harper & Brothers, New York, London,1899. This overview of Hawai'ian history and culture with board and canoe surf riding, along with sledging, is described in a chapter on games. The illustration of the sledge on page 228 has often been reproduced. Unfortunately, the photograph of Waikiki, "where the natives ride the surf," has no swell at all. Whitney notes that "with the exception of surf-riding, all the old games have passed." 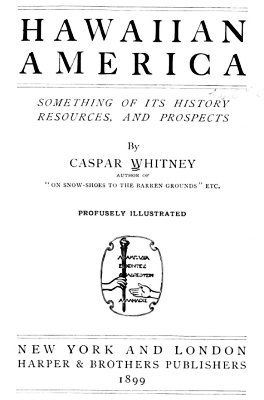 Caspar Whitneywas an American author, editor, explorer, outdoorsman and war correspondent. He originated the concept of the All-American team in college football in 1889 when he worked for Harper's Magazine. From 1900, he was an owner and editor-in-chief of the monthly Outing magazine, which promoted the outdoors and sporting pursuits, as well as a good deal of adventure fiction; authors included Jack London and Clarence E. Mulford. He was a founding member of The Explorers Club (1904) after expeditions in North and South America. civilization has lessened their opportunity for indulgence, yet it has not diminished their amphibious tendencies. One of the old sports which remains to keep alive native skill, and in modified form to captivate every foreigner who tries it, is surf-riding. It may, in fact, be called the national sport of Hawaii, and formerly the youth took great pride in their skill and daring. (surf-board) gives place almost invariably to the canoe. The onini is a board made of the famous koa wood, about twelve to eighteen inches wide and from six to eight feet long, often with flat surface, but usually with both sides slightly rounded. the wave overtakes them, when by expert manipulation the onini is kept on the face of the wave and carried towards the beach at steamboat speed. As the board rests on the face of the wave at a considerable angle, some idea may be had of the skill required to keep it there during the quarter-mile rush for the shore. And yet some of the natives become so expert that they stand upon the board during the steadier periods of its flight. Surf-riding in a canoe sounds tame after this; but it really is not. There is precisely the same procedure, the identical sensations, and indeed I am of half a mind that greater skill is required to hold the larger, clumsier canoe on the face of the wave than the lighter, handier onini. The advantage of the canoe is the opportunity it offers for gregarious enjoyment. WHERE THE NATIVES BATHE AND RIDE THE SURF AT HONOLULU - DIAMOND HEAD IN THE BACKGROUND. ... a particle, and with good reason, for it could not be improved on for Hawaii's open waterways. It is a dugout, fairly deep and narrow, with bow and stern starboard outriggers about five feet long, to which at the farthermost outward end is attached a fairly large, round (about six inches in diameter), but very buoyant spar that is about three-quarters the length of the canoe. With this rig the canoes go through rather rough water; and the fact that in the early days the natives cruised from one island to another in them rather indorses their seaworthiness. The paddies are somewhat long and stout, with very short, wide blades, adapted to rough, open-water work. There must be at least a couple of strong paddlers, and a helmsman of experience and skill in surf-riding, else the canoe will be swamped at once. Oftentimes the surf is running high and makes the outgoing exciting, but the canoe is taken well out before turning to wait for a wave large enough to assure a carry to the shore. Several waves are permitted to pass perhaps before a big one is sighted three hundred yards away, and then - "Hoi! hoi!" (Paddle! paddle!) cries the helmsman, and desperate, quick strokes send the canoe forward at a rattling pace, which must be maintained until the wave overtakes the boat. If the canoe has not pace enough, the wave swamps it and rolls on towards shore, leaving a capsized party in its wake. ... wave picking up the canoe, the most thrilling sensation you have ever experienced. Paddling like mad, your back towards the sea, you have not seen the wave drawing nearer and nearer. Suddenly the canoe is lifted, without shock, and carried forward at great speed, and you know you are at least successfully launched in the great native sport. In front, the bow, cutting the water, sends strings of spray backward and upward ; at the stern, the great blue-green wall curls above and over you, and if you are a sentient creature your pulse thrills with an exhilaration that no other sport in my experience can supply. It is tobogganing without its gasping, blinding speed. Always the steersman must be on the alert, for the incoming wave has many eccentricities, and often the desperate paddling must be resorted to for a few moments at a time to avoid being capsized. The canoe must be kept on the face of the wave or it will be quickly overwhelmed. Next to surf-riding, the most honored of ancient Hawaiian sports was hill-coasting on long, narrow sledges. It would seem impossible that any speed could be made under the conditions, and yet abundant evidence exists to prove it. The course, made of dry grass and smooth stones, was laid down the side of a steep hill, and the pace attained sent the coaster quite a distance across the plain at the foot of the runway. ... plainly marking several precipitous hill-sides, and suggesting a considerable amount of toil in their original making. The sledge was only six inches wide by three inches deep, and about twelve feet long, made very stoutly, and of hard wood. Hill-coasting must have been somewhat of an expensive sport, suited only to the alii. With the exception of surf-riding, all the old games have passed, and in their stead have come the several varieties of modem sport. There is an athletic association, a bicycle-track, a rifle association, a yacht club with many boats, and a rowing association of three clubs. The various schools annually put forth baseball and football teams, and the native takes well to both games. In track athletics there is less development, and what there is is chiefly confined to Hawaiians of white parentage. The native pure and simple takes more kindly to boating, and, in fact, so does all Hawaii, for holidays are made of the annual yacht regatta and boat-club race-days. Moreover, the rowing form is surprisingly good, nearly equal to the average shown by American boat-club crews. Geoff Cater (2012-2013) : Caspar Whitney : Hawai'ian Games, 1899.